SEOUL: North Korean leader Kim Jong Un has given his young, stylish wife the title of First Lady in what analysts say is a major boost to her status ahead of back-to-back summits with South Korea and the United States. Ri Sol Ju has often accompanied Kim to official events but made her first solo public appearance last weekend at a ballet performance by a visiting Chinese troupe. The North's state media reported the outing referring to her as the "respected First Lady" - the first time the title has been used in more than 40 years - and with the addition of an adjective usually reserved for the country's leaders. North Korea's elderly star anchorwoman Ri Chun Hee, who is often drafted in for major announcements, delivered the news of her attendance on television, further enhancing Ri's standing. Dressed in a dusty pink two-piece skirt suit, Ri was accompanied by senior North Korean officials often seen with the leader, including Kim's younger sister, Yo Jong. Ri, a former star singer, emerged in 2012 and has been regarded as one of the most high-profile women in the isolated, deeply patriarchal nation, but with a limited role as Kim's stylish, coy wife. Analysts say her promotion is likely to be part of an effort to paint North Korea as a "normal state" as it prepares for summits with South Korean President Moon Jae-in next Friday and later with US President Donald Trump. "Promoting Ri Sol Ju is the most effective marketing strategy," An Chan-il, a defector researcher who runs the World Institute for North Korea Studies, told AFP. Ri was previously referred to as "comrade" by the North's state media, and the weekend report was the first time the First Lady title had been used to describe the leader's spouse since 1974, when it was applied to Kim Song Ae, the second wife of North Korea's founder Kim Il Sung. Little is known about Ri, who is believed to be 29 and to have three children with Kim, at least one of them a daughter. A former member of the North's Unhasu Orchestra, Ri reportedly attended a music school in China and visited South Korea in 2005 as a cheerleader for her country's squad in an international sporting event. She is known to be a fashion aficionado and is often pictured wearing luxury outfits, on one occasion carrying what appeared to be a Christian Dior handbag, in a country plagued by chronic poverty. Some analysts point to Kim's marginalised mother Ko Yong Hui as another factor driving Ri's expanded role. Ko, an ethnic Korean from Japan, had three children with Kim's father and predecessor Kim Jong Il, but had a low profile throughout her 28-year marriage. A grave was only built for her in 2012, after Kim inherited power. "I think Kim Jong Un's trauma of watching his own mother living in the shadows also factored in," said Shin Beom-chul, an analyst at the Asan Institute for Policy Studies. 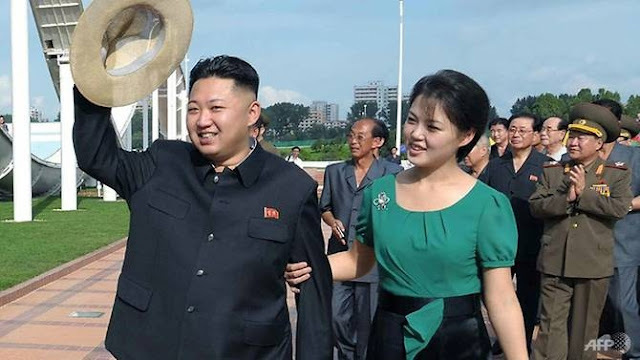 Unlike his father and grandfather, Kim is often seen accompanied by the women in his life - namely Ri and Yo Jong - in a break from the past when leaders' spouses or sisters rarely made public appearances. His late father was known to be blunt and secretive, but the younger Kim - whose regime stands accused of widespread human rights violations by critics - has cultivated an outgoing and informal style, and his marriage also appears to be different. According to the Japanese daily Asahi Shimbun, Ri referred to the North Korean leader as "my husband" in a meeting with the South's officials in Pyongyang, and giggled and clapped when one of them suggested that Kim quit smoking.